Bur clover (Medicago polymorpha L.) is a Mediterranean winter and annual clover. It is fast-growing, easily reseeds, improves soils and provides good quality forage to grazing livestock. Bur clover is an annual sprawling legume. Its stems are weak and reach a length of 60-75 cm. They often root from the nodes. In thick stands, the stems may become erect, reaching to a height of 60 cm. The root system has a tap root that is difficult to pull out when established. 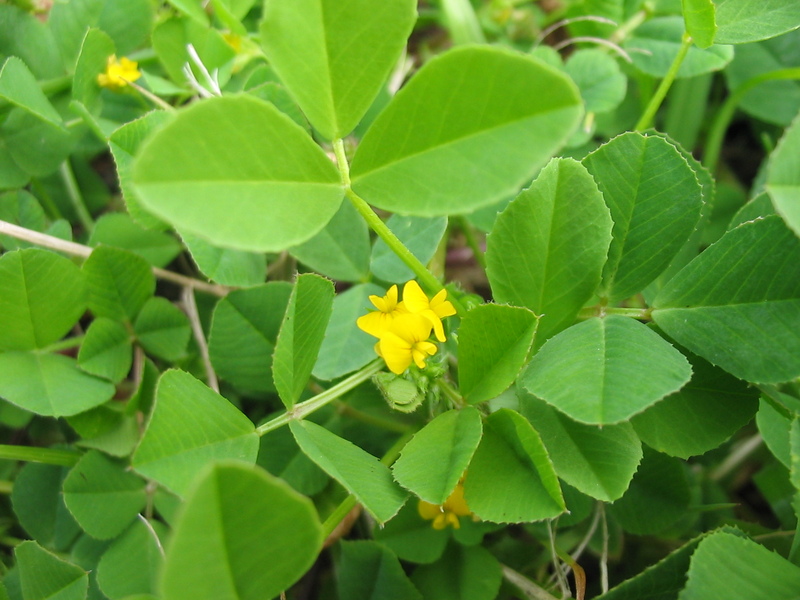 The leaves are trifoliate, clover-like and toothed towards the top. Inflorescences are borne at the end of the stems. The flowers are bright yellow in colour, pea-like in shape, attractive to butterflies and pollinating insects. The fruit (bur) is a prickly, flattened and coiled pod, about 6-7 mm in length. Pod prickles often end in tiny hooks and cling to animal fur/wool. 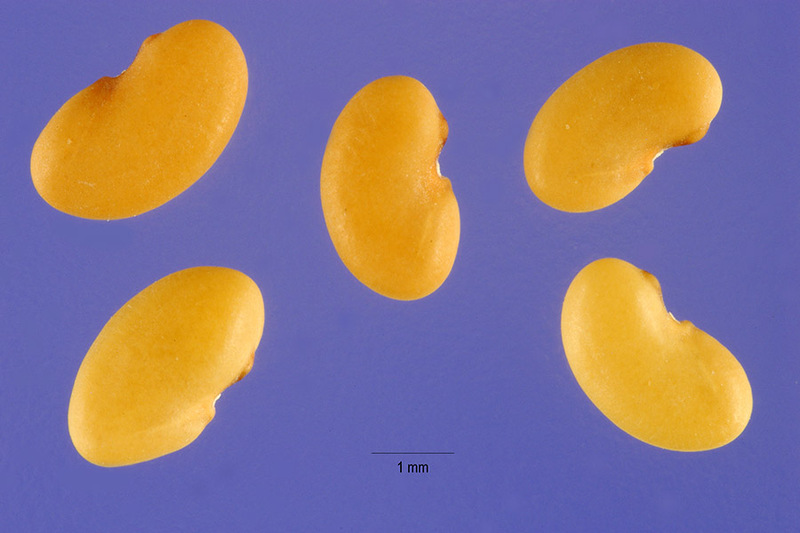 The pods contain several kidney shaped seeds (Popay, 2014; USDA NRCS, 2002). Bur clover is mainly used as good quality forage. All classes of livestock, except horses and mules, eat it readily. Its use for sheep may raise problems because the prickly burs stick in the wool and can reduce its quality (USDA NRCS, 2002). Bur clover is a fast growing, N-fixing legume that can be used as a valuable cover crop in orchards and vineyards where it reseeds every year. It can be mowed to control excessive growth without compromising the seed crop for the next year (USDA NRCS, 2002). Bur clover is native to the Mediterranean Basin and Central Asia and is now found worldwide. It is particularly suited to regions with a Mediterranean-type climate, but is not confined to them. Introduction outside its native area can be due to accidental transport of the spiny seed pods or to its use as a fodder plant (Popay, 2014). Bur clover is a weedy species that can be found on agricultural land, roadsides and other disturbed areas. It is found in lawns, where its burs are able to cling to the clothing of people or fur of any animal that crosses it, thus facilitating spread by seeds (Popay, 2014). Bur clover is found in both hemispheres from sea level up to an altitude of 900 m in Turkey, 1500 m in the Himalayas and 1900 m in Tanzania (Ecocrop, 2016). It is particularly adapted to mild, moist winters and hot, dry summers typical of Mediterranean-type climates. Medicago polymorpha does well where annual rainfall ranges from 250 to 650 mm. It has a relatively low tolerance of frost (USDA NRCS, 2002). Seed germination occurs mainly between 10 to 25°C and is very low above 30°C (Butler et al., 2014). Bur clover grows on a wide range of soils, from sandy acidic to clayey alkaline soils (Porqueddu et al., 2006). It is not as tolerant as subterranean clover (Trifolium subterraneum) to acidic conditions, and optimal growth occurs within pH 4.7 and 8. It prefers well-drained heavy loams in valleys and foothills. Bur clover is not sensitive to light and can grow in full light or heavy shade (USDA NRCS, 2002). Bur clover may occur in pure stands, but in the USA it is often grown in association with other winter annuals, such as soft brome (Bromus hordeaceus), wild oats, and filaree species (Erodium spp.). As a winter annual, bur clover germinates in autumn following the first rains of the season (USDA NRCS, 2002). Flowering occurs in April and pods are mature in May (Sitzia et al., 2000). For permanent pasture a combination of Bermuda grass (Cynodon dactylon) and bur clover has been very successful. The grass provides pasture during the warm months and the fast growing clover provides pasture during winter and spring (USDA NRCS, 2002). As with other clovers, bur clover is a heavy seed producer (200-1000 kg/ha). Seeds are mostly hard-coated (more than 90%), which enables viable storage in seed banks and self-regeneration over several years (48% viable seeds after 3 years) (Walsh et al., 2013). This trait allows the use of bur clover under a ley farming system, i.e. a 2-year rotation between a cereal (wheat) and the legume, self-reseeding one year (year of crop cultivation) and self-germinating from the seed bank the next year (year of grazing) (Carr et al., 2005). Bur clover results in greater crop yields with an enriched level of protein (Thomas et al., 2009). This is not consistent with earlier observations in humid areas of Ethiopia. There, undersowing bur clover under a wheat crop resulted in lower wheat yield (-23.6%) but higher tef yield (+64%) in the following year (Pülschen, 1992). Annual DM production of bur clover may range from 1 to 9 t DM/ha, depending on cultivar and climatic conditions (Muir et al., 2009; Muir et al., 2005; Shrestha et al., 1998; Zhu et al., 1996). Pod yield can be as high as 2 t DM/ha (Fois et al., 2005). Once established, bur clover is difficult to control. Mechanical removal of top growth is not sufficient to eradicate the plant. Besides, pulling the plant out can result in leaving the tap roots and other plant material. In some situations, if not properly managed, Medicago polymorpha may become weedy or invasive, thus displacing more desirable vegetation. It is considered noxious in many areas such as Arizona (USA) and most places of Oceania and the Pacific Islands (US Forest Service, 2013; Queensland Government, 2011; USDA NRCS, 2002). 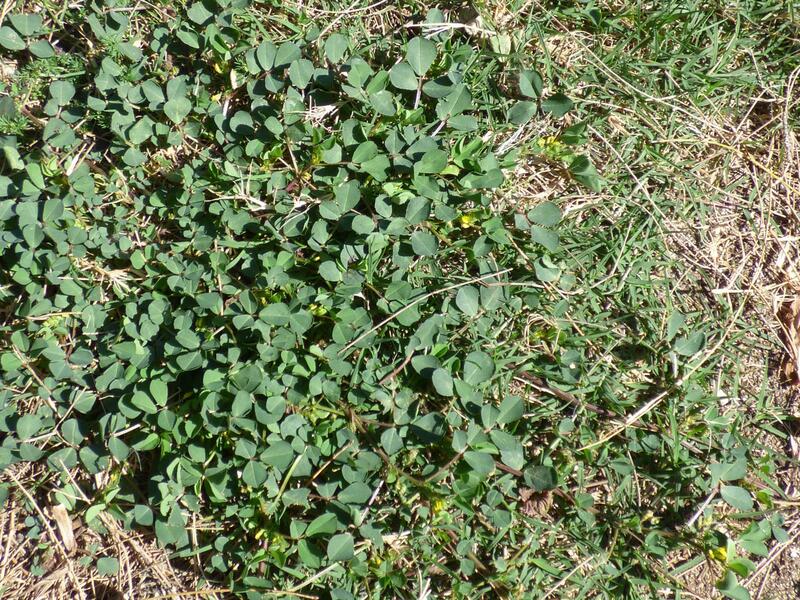 As with other annual legumes (medics or subterranean clover), bur clover may be used as a winter cover crop in vineyards to avoid soil erosion and weed development. It provides ground cover without competing with the grape vines for water during summer as it is already dead (Porqueddu et al., 2000). Bur clover is useful for soil renovation and improvement, and contributes to nutrient recycling (Howieson et al., 2000; Puckridge et al., 1983). Bur clover can provide green manure; it proved to be superior to NPK fertilizer in maize crops to increase shoot, root and cob biomass (Ecocrop, 2016; Rukhsana Bajwa et al., 2002). Like other clovers, bur clover is a high-quality legume, particularly during winter and early spring before the flowering stage, when the protein content is high (20-28% of DM) and fibre low (30-47% NDF and 17-30% ADF of DM) (Muir et al., 2006; Fois et al., 2005; Muir et al., 2005; Alford et al., 2003; Sitzia et al., 2000; Muir et al., 1999; Zhu et al., 1996). Nutritive value is lower in late spring and summer after seed formation, with protein at about 13-15% of DM, and ADF between 30-36% of DM (Addis et al., 2005; Muir et al., 2005). In autumn, fibre of dry bur clover may be high (NDF 71% and ADF 58% of DM), while maintaining a medium protein content (12% of DM) (Alford et al., 2003). Lignin ranges from 3 to 11% of DM according to the season of harvest and the cultivar (Muir et al., 2009; Cabiddu et al., 2006; Fois et al., 2005; Sitzia et al., 2000). 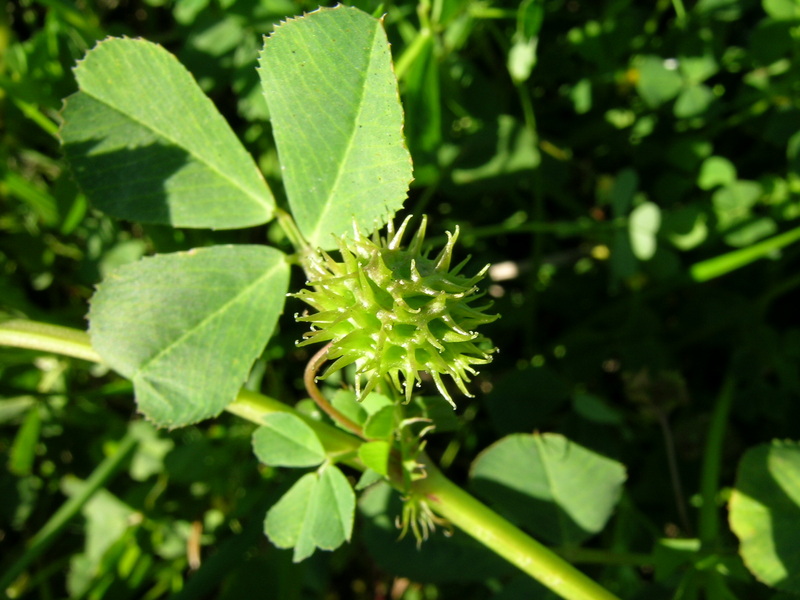 Bur clover pods maintain a relatively high nutritional value due to their high protein content (20-24% of DM), though their fibre content is also high (NDF 54-61%, ADF 36-45% and ADL 10-12% of DM) (Fois et al., 2005; Porqueddu, 2001; Fois et al., 2000). A lower protein content of 11% has also been reported (Chriyaa et al., 1997). In summer, bur clover stubble is low in protein (10-11% of DM) and its fibre content is close to that of pods (Fois et al., 2005; Fois et al., 2000). Like other clovers, bur clover is reported to cause bloat, especially after lush growth and with animals that are not accustomed to grazing it (USDA NRCS, 2002). In sheep, bur clover occasionally causes red gut, an enlargement of the large intestine due to highly digestible feeds. To cope with enlargement the intestine twists and may become obstructed, resulting in sudden death (Howie et al., 2007; Gumbrell, 1997). Bur clover can cause photosensitisation in horses (Howie et al., 2007). Like alfalfa, bur clover contains phytoestrogens/coumestrol that can have negative effects on the reproduction of grazing livestock, though this is rarely reported. Levels of phytoestrogens/coumestrol tend to be higher under conditions of phosphorus deficiency and fungal infection (Howie et al., 2007; Fuller, 2004). Bur clover is frequently used in sheep production systems in all Mediterranean climatic regions, such as southern Europe, North Africa, South America and Australia, due to its adaptation to a wide range of edaphic conditions (Porqueddu et al., 2006). Bur clover is an important pasture plant and its dry fruits are a valuable concentrated fodder for pasture animals during the dry season. They are not suitable for sheep pasture as the fruits become entangled in the wool. 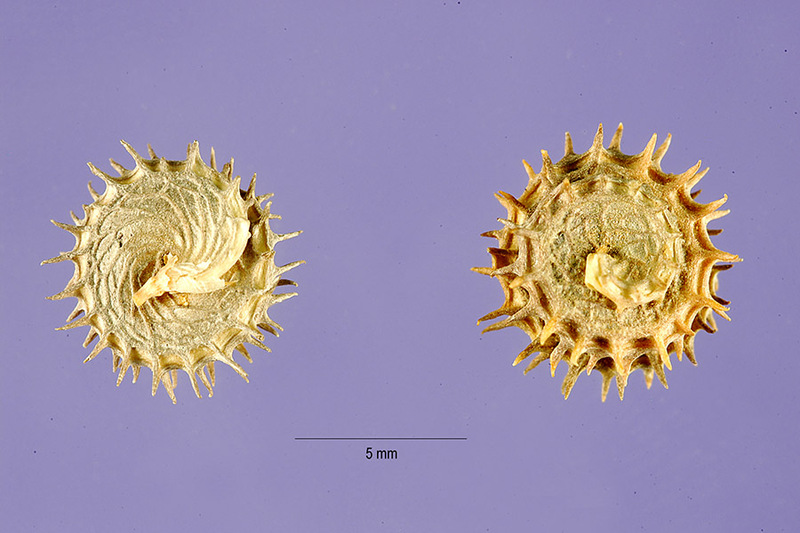 Consumption of the pods is most noticeable after the spiny burs have been softened by fall rain (USDA NRCS, 2002). In vitro digestibility of bur clover pastures was reported to be as high as that of subterranean clover or sulla (Hedysarum coronarium) pastures (Sölter et al., 2007). Bur clover pods have a low apparent OM digestibility (40-50%) (Porqueddu, 2001). Voluntary intake of fresh bur clover fed alone to lactating ewes may be as high as 102 (winter) or 107 (spring) g/kg BW0.75, which was greater by 55 and 36% to voluntary intake of fresh annual ryegrass in winter and spring, respectively (Addis et al., 2005). When fed fresh with 350-450 g concentrate/day, a voluntary intake of 108 to 175 g/kg BW0.75 has been observed, greater than that observed with annual ryegrass or sulla fed as the main forage (Cabiddu et al., 2006). In winter (vegetative stage), high feeding levels coupled with a high nutritive value allowed a level of milk production from lactating ewes fed on fresh bur clover similar or greater to those fed on fresh sulla. In spring (reproductive stage), despite a higher intake level, milk production of ewes fed on bur clover was lower than those fed on sulla, probably due to its large drop in nutritive value between the vegetative and reproductive stages (Cabiddu et al., 2006). Supplementing wethers fed on wheat straw with pods of bur clover increased total intake from 57 to 73 g DM/kg BW0.75 (of which half was medic pods), i.e. a 27% increase in total intake level and a global substitution rate of 54% between pods and straw (Chriyaa et al., 1997). This positive effect was similar to that measured with alfalfa hay or old man saltbush (Atriplex nummularia) foliage used as supplements. However, introducing bur clover pods did not increase DM, OM or fibre digestibility of the diet (Chriyaa et al., 1997). In pastures containing 49% bur clover, an intake level of 120 g/kg BW0.75 has been observed, which was greater than that observed on subterranean or sulla-based pastures (+13%; Molle et al., 2008). Milk yield of lactating ewes also tended to be greater when grazed on bur clover pastures (1640 mL/d, +6%). Milk production of dairy ewes grazing bur clover may be greater than 1500 g/d throughout the grazing season (Fois et al., 2005). In Italy, similar milk yields were observed between lactating ewes grazing either safflower, chicory or bur clover, with greater milk fat and protein concentrations with bur clover (Landau et al., 2005). Mature bur clover (pods and dry stubble) may form the basis of the diet of grazing sheep, allowing maintenance of weight and body condition score throughout the summer. An intake level of 1200 g/d may be achieved, of which 50% are pods (more than 500 g pods consumed per day) (Fois et al., 2000). When sheep graze bur clover, the burs entangle in the wool, causing a significant drop in quality of the Australian wool clip, thus reducing its economical value. Burs are difficult to remove. Carding may break them into smaller pieces and their coils tend to unwind into thin eyebrow-shaped pieces, which are even more difficult to remove and can persist into the finished product (Popay, 2014). No publication is available in the international literature on the use of bur clover for feeding domestic rabbit (August 2016). However, in Australia and Chile, this legume is eaten by wild rabbits (Oryctolagus cuniculus) when available (Figueroa et al., 2004; Croft et al., 2002). This has been confirmed by the observation of bur clover seeds and vegetative parts in the stomach content of captured rabbits in Australia (Martin et al., 2007). Martin, G. R.; Twigg, L. E.; Zampichelli, L., 2007. Seasonal changes in the diet of the European rabbit (Oryctolagus cuniculus) from three different Mediterranean habitats in south-western Australia. Wildlife Research, 34 (1): 25-42.